Born on September 6, 1955, Benson grew up in Odessa, Texas, which he prefers to call "Odessalation." He expressed interest in the arts even as a child, and he took piano lessons for a few years before deciding to teach himself instead. Benson reached concert proficiency and still often performs. Benson considers his early and avid childhood reading his best preparation for a career in writing. Benson later became active in the theater. He enrolled at the University of Texas at Austin in 1973 as an acting major, but soon changed to directing. After a brief stint at a playhouse in Houston, Benson moved to New York and immersed himself in the theater scene. Throughout the 1980s, he directed multiple plays while working a day job at a financial services firm and later as a spec typist for legendary architect. IM Pei. With the release of the first "Dungeons and Dragons," Benson turned his attention to role-playing games. He worked on multiple games, including several James Bond games before moving his family back to Houston to take a position writing computer games. Benson spent the next several years working for various companies in this field. These Bond video games were certainly not Benson's first encounter with James Bond; he names watching the film adaptation of Goldfinger at the age of nine a truly life-changing event. From then on, Benson was a dedicated 007 fan. He even served as president of the James Bond fan club while living in Manhattan. He also taught a class on James Bond at the New School for Social Research in 1989. 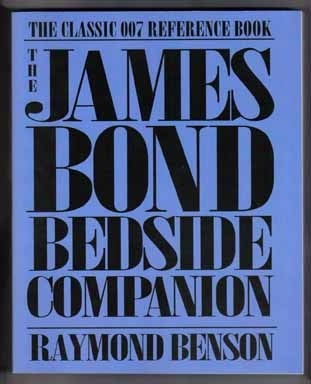 Several years prior, Benson had penned The James Bond Bedside Companion (1984). The book took three years of research and included not only a biography of Ian Fleming, but also analyses of all the 007 books and movies and a history of the James Bond phenomenon. The first of its kind, The James Bond Bedside Companion earned an Edgar Allan Poe Award nomination for Best Biographical/Critical Work. In 1988, it was reprinted in the U.S. and published for the first time in the UK. The first edition remains sought after by Bond enthusiasts and rare book collectors. Benson's continued interest and involvement made him an ideal choice to replace John Gardner when he retired. 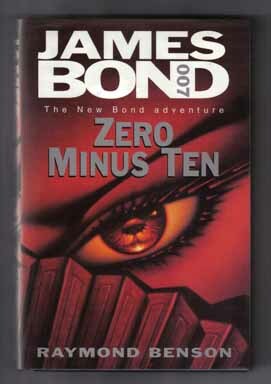 Benson spent most of 1996 writing his first James Bond novel, Zero Minus Ten. Over the next years, he'd go on to write several more 007 novels, three film novelizations, and three short stories. Benson has also published many other original novels, most notably the Black Stiletto series and Sweetie's Diamonds. For more information about Raymond Benson's life and career, visit his official website.